Classic Australian Contests of the '70s: With star guest posers. In this DVD we have assembled our earliest Australian contest film footage going right back to 1972. 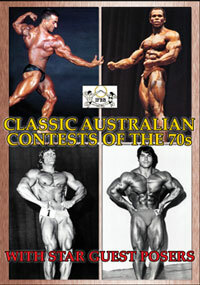 Take a look back in time at the many greatest physique stars to grace a posing stage down under. At some of these National Championships you will see star guest posers such as ARNOLD SCHWARZENEGGER, FRANCO COLUMBU, SERGE NUBRET and ROGER WALKER. These superstar guests were at the peak of their careers. 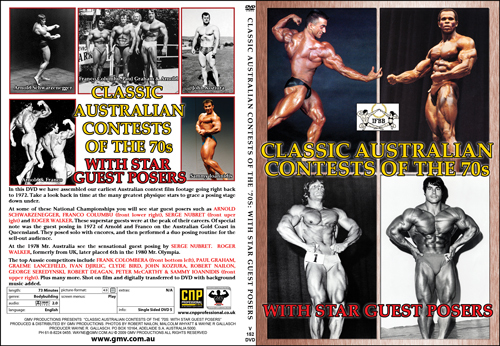 Of special note was the guest posing in 1972 of Arnold and Franco on the Australian Gold Coast in Queensland. They posed solo with long encores, and then performed a duo posing routine for the sell-out audience. At the 1977 Mr. Australia see the sensational guest posing by SERGE NUBRET. ROGER WALKER, formerly from UK, later placed 6th in the 1980 Mr. Olympia representing Australia. The top Aussie competitors include FRANK COLOMBERA, PAUL GRAHAM, GRAEME LANCEFIELD, IVAN DJIRLIC, CLYDE BIRD, JOHN KOZIURA, ROBERT NAILON, GEORGE SEREDYNSKI, ROBERT DEEGAN, PETER McCARTHY and SAMMY IOANNIDIS. Plus many more great physiques. Shot on film and digitally transferred to DVD with background music added. Front Cover Photos: Upper left Sammy Ioannidis, Upper right Serge Nubret, Lower left Frank Colombera, Lower right Franco Columbu. Photos courtesy Robert Nailon, Malcolm Whyatt and Wayne Gallasch. Back in the 70s in Australia, nobody made any film record of Australian contests. Film was expensive and technology was difficult for recording live events on a low budget. Sound film was way more expensive and out of the question. In 1972 with Arnold Schwarzenegger and Franco Columbu coming to Australia as guest posers at the Southern Universe Contest on the Gold Coast, it was time to shoot some of my first ever major contest footage in Australia. This was followed by my filming at the 1972 Mr Australia. Both contests being held under IFBB rules. 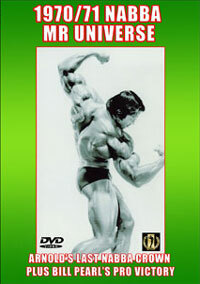 This is a DVD of major historical importance both in the context of Aussie bodybuilding, but also for world bodybuilding. This was the early days of USA superstars making posing tours to overseas countries. It was also Arnold and Franco's first visit to Australia. The day after the Gold Coast Southern Universe contest, I shot my classic pumping and posing films with Arnold and Franco poolside at the former Chevron Hotel pool in Surfer’s Paradise. On the rear cover you will see Robert Nailon’s historic photo from the end of my filming session showing Paul Graham with Arnold and Franco. My thanks to Robert for this great photograph. Please click here for details on the ARNOLD & FRANCO SEGMENT as seen as part of Arnold The Early Years. 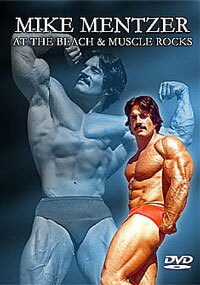 Paul Graham and Frank Colombera were the leading and most famous bodybuilders in Australia in the early 70s. In these 2 classic 1972 contests you will see Frank come out a very narrow winner over Paul. It has been my privilege to have recorded this early history of the sport in Australia on movie film. My thanks to promoter Bob Bruce who invited me to come and cover his event on film. He took an enormous financial risk at the time in bringing to Australia both Arnold and Franco. 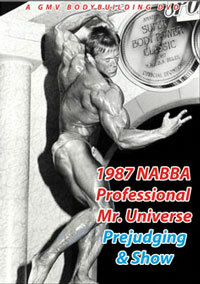 Bob is one of the unsung heroes in the history of the sport of bodybuilding in Australia. 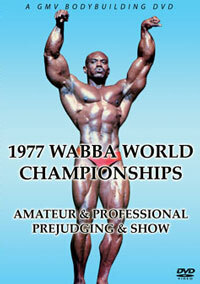 The next major international star seen in this DVD is Serge Nubret, who was the special guest poser at the 1977 Mr. Australia won by Ivan Djirlic. 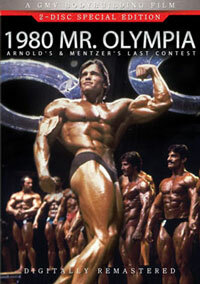 This was 2 years after Serge was runner up to Arnold in the 1975 Mr. Olympia. 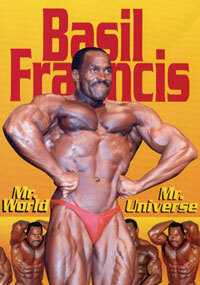 He was in incredible shape and brought the house down, similarly to Arnold and Franco in Australia, 5 years before. 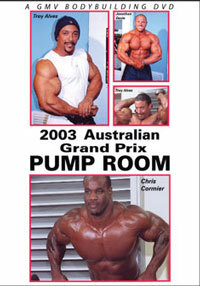 Many of the top Australians in this DVD achieved international fame and huge popularity in their careers. Top 3 awards to Colombera, Graham and Koziura. Separate top 3 awards to Seredynski, Deegan and Bird. Guest posing by ARNOLD SCHWARZENEGGER plus an encore. Seredynski and his runners-up pose with Arnold for photos. 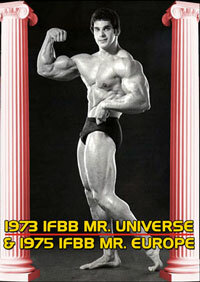 Guest posing by PETER McCARTHY – Mr. Australia 1967 & 1971. Posing and posedown by the top 2 guys Ivan Djirlic and Graeme Lancefield. Serge Nubret makes the awards to Ivan Djirlic and Graeme Lancefield. Guest posing by SERGE NUBRET plus an encore.